NASA recently launched two sounding rockets in the atmosphere above Norway. Read on to learn more about what they are researching. NASA launched two sounding rockets into the atmosphere over Norway last week in an attempt to learn more about auroral winds. A sounding rocket is a research rocket designed to take measurements and perform scientific experiments in sub-orbital flight. NASA wants to know more about the part of the ionosphere where astronauts spend much of their time. Aurora Borealis captures our attention each time it appears in the sky overhead. The collision of Earth’s atmosphere and particles from the sun create the colorful lights. What we cannot see are the kinetic and thermal energies that are released. In addition, scientists want to look at the auroral forcing from this event. Auroral forcing is the total amount of energy that enters and leaves Earth’s geospace system. NASA has developed the Auroral Zone Upwelling Rocket Experiment or AZURE. They created this to learn more about auroras. Aside from astronauts working in the auroral part of the atmosphere, GPS satellites and communication satellites also orbit there. What impact does the aurora have on these essential tools? That is what scientists want to know. The planet’s magnetic field lines bend down into the atmosphere. This field allows particles from space to blend with Earth’s particles. In addition, AZURE will study the flow of particles in the ionosphere. They want to focus on the E and F regions with their sounding rockets. The E region lies between 56 and 93 miles above the Earth’s surface. This region reflects radio waves in its electrically charged atmosphere. In addition, the F region will also fall under the scope of the study. The F region lies between 93 and 310 miles above the Earth. To study these regions, scientists launched rockets from the Andoya and Svalbard rocket ranges in Norway. These rockets will study polar regions where aurora’s commonly occurred. For example, the rockets will test the vertical winds in these regions. The winds redistribute the chemical composition of the atmosphere. The E and F regions contain free electrons. How did they become free? The Sun’s rays energized the atoms which released the electrons. Once the sun goes down, electrons recombine with the positively charged ions they left during the sunny day. The daily occurrence of this separation and joining makes the E and F region highly active. What chemicals did they use? The rockets deployed visible tracers, TMA, and a barium/strontium mixture. These mixtures are similar to the substances found in fireworks. Consequently, these mixtures create clouds with colors. The colors will help scientists track the flow of neutral and charged particles. The tracers were launched between 71 and 155 miles above the earth. In addition, the sounding rockets will provide data on the vertical and horizontal flow of particles. NASA has more missions planned until the end of 2020. 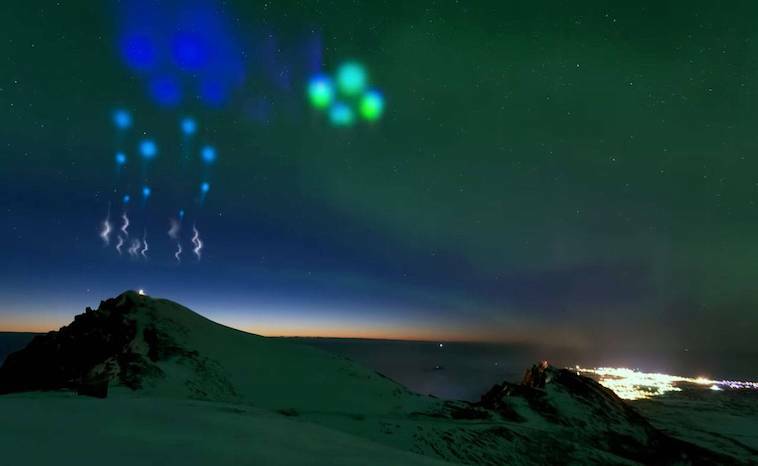 Other nations will join NASA in this study of the Auroral Winds. We look forward to learning more from their research.